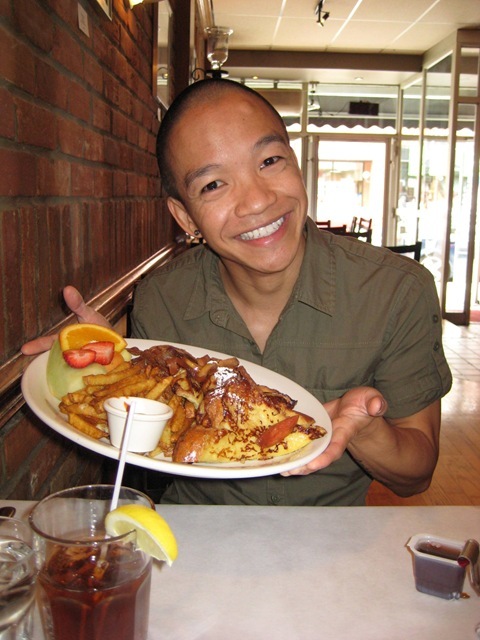 Sunny Fong was the winner of Project Runway Canada Season 2. Since winning, he has shown at Toronto Fashion Week twice with his Vawk clothing line, including his debut show at the Art Gallery of Ontario. I remember watching Project Runway and Sunny’s designs were always pretty amazing. I’ve never lunched with a fashion designer before so I knew this could be a great opportunity to learn about a profession that I know little about. We ate at Sambucas on Church. It was actually quite difficult to find a place to eat, as a lot of the restaurants on Church are closed on Mondays. Who knew? I had the pasta special, which was a chicken pesto blend of delishness. It also came with a garden salad and garlic bread (which I did not have room for). Sunny had stuffed French toast, which came with bacon, fruit and fries. The portions at this place are ENORMOUS! I had a diet Coke and he had an iced tea. Total bill was $26 with tax. Sunny talked a bit about his research process when he is designing. He chooses something as his inspiration and then builds from there. His most recent collection was inspired by mushrooms after Sunny was watching Planet Earth. He said he would look online for images and information on mushrooms. He then went back and watched Planet Earth again and the documentary spoke about decay during the mushroom section. He then started looking at images of decay and the inspiration grew and grew until it was an entire collection – all started with mushrooms. This creative process is one of Sunny’s favourite parts of designing. As someone who also works in a creative industry, it’s always interesting to hear how others go through the process and get inspired. If you watched Sunny when he was on Project Runway, you would know that he came across as really nice and genuine and he is just like that in person. A really great person to lunch with! Sunny and I soon figured out that we both went to Ryerson. He studied Film and I took Radio and Television. His fashion and design knowledge is all self-taught. His sister studied fashion and Sunny let me know that he did read some of her textbooks. Filmmaking was another creative outlet for Sunny and he also has taken some of the skills from this to build his own web design company that has helped bring in funds allowing him to focus on fashion designing. Since I know little about how one does put a line together, I asked Sunny if he sewed all of his own clothes or simply created the designs and had others put them together. He says at this stage of his career, he likes to sew everything on his own. This way, through the process he can figure out if the design works, what does, what doesn’t and fix along the way. He says someone like Karl Lagerfeld, who has so much experience designing, can simply draw a design and trust that it will work. Sunny still sees the whole process as a learning experience. As Lagerfeld was mentioned, it got us to talking about the stereotype of the fashion industry, with Lagerfeld, Anna Wintour and The Devil Wears Prada, that you need to be mean to get ahead. Again, Sunny doesn’t really fit this stereotype. Fashion is a business like anything else, he said, so you do need to have that killer instinct, to stand up for yourself and be assertive or you’ll be left in the background. But like any stereotype, there is some truth and also some fiction in these fashion industry assumptions. I asked Sunny about his favourite designers. He couldn’t narrow it down to one. He looks to Alexander McQueen for construction (we agreed on our love for his lobster claw shoes), Cavalli and Gucci for the sexiness and his list went on. It seems that Sunny is able to take inspiration from all sorts of designers, which again speaks to his creative process. Having lunch with Sunny and speaking to him about his work was really quite amazing. He has such a passion for what he does and such a strong commitment to doing it well. Sunny is at the start of a really exciting career and I can’t wait to watch him succeed. And of course, I can’t wait to buy one of his pieces! Great blog post! Sunny was my fav on Season 2 but I have to say that I’m unsure about the lobster claw shoes. Yikes!